Press sample Aveeno has always been known for their natural and gentle, senstive skin friendly products that are fragrance-free. But with their new Skin Relief Gentle Scent™ Collection, now even sensitive skin can have a little fun!! Aveeno Skin Relief Gentle Scent™ Collection is their first line of delightfully scented body washes and lotions specifically designed for sensitive skin. Formulated with ACTIVE NATURALS® Oat, these unique, dermatologist recommended products are proven to soothe itchy, extra-dry skin. Available in two new gentle scents, Nourishing Coconut and Soothing Oat & Chamomile, the allergy-tested formulas are clinically shown to be as gentle on skin as fragrance-free alternatives! I tried the Aveeno Skin Relief Gentle Scent lotion and body wash in the Nourishing Coconut scent and they really are a delightful duo for dry, sensitive skin! 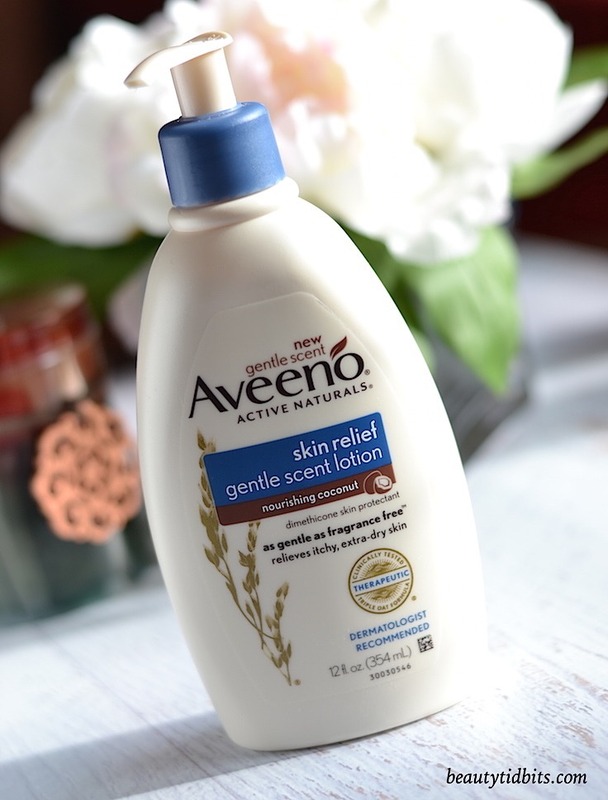 Infused with Active Naturals® Triple Oat Complex – which contains natural colloidal oatmeal to help seal in moisture, oat essence to calm skin and oat oil to help restore the skin’s moisture barrier and soothe itchy, dry skin in just one day – the Aveeno skin relief gentle scent lotion does a great job of hydrating without a greasy feel! It’s rich and creamy yet has a wonderfully lightweight texture that absorbs super quickly without leaving a greasy, sticky residue (so I can get dressed quickly right after lathering up post-shower!) The formula leaves my dry winter skin feeling soft, smooth and moisturized all day and keeps the winter itch away. And not to mention, I adore the light coconut scent that’s so soothing & calming. It’s doesn’t have that artificially sweet or sugary, overtly coconut smell and has a nice, clean feel…gotta love that! As for the Aveeno Gentle Scent Body Wash, it also has a mild and gentle formula (soap-free and dye-free) specially designed to soothe and moisturize itchy, dry and sensitive skin. Infused with soothing oatmeal and a light coconut scent, it’s as gentle as fragrance-free and cleanses well without ever leaving my skin feeling dry or tight. I have also been using this body wash for my little girl and it has been great for her dry, sensitive skin. And yeah, she loves the coconut scent as much as I do! The new AVEENO Skin Relief Gentle Scent™ Body Wash and Lotion are now available at drugstores and mass retailers nationwide. Whether you have senstive skin or not, these new Aveeno products would be a delightful addition to your winter skincare routine!